People are turning more and more to their open fires, wood and multi fuel burners, partly to save money and partly as a way of going “green”. But what do you do with the perennial problem of disposing of ash and hot cinders? Tippy ash carriers were invented to deal with this problem. They safely and cleanly enclose the hot ashes so that no more flooring will be spoiled or ashes blown in your face when you put them outside. 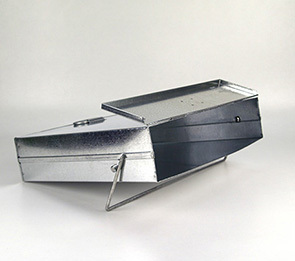 Made from high quality galvanised British steel a Tippy is the perfect solution to a messy problem. We make a wide variety of sizes to suit even the smallest and widest stoves. Please don’t mistake cheap imitations for our product – make sure you get the real thing and enjoy the benefits for years to come!